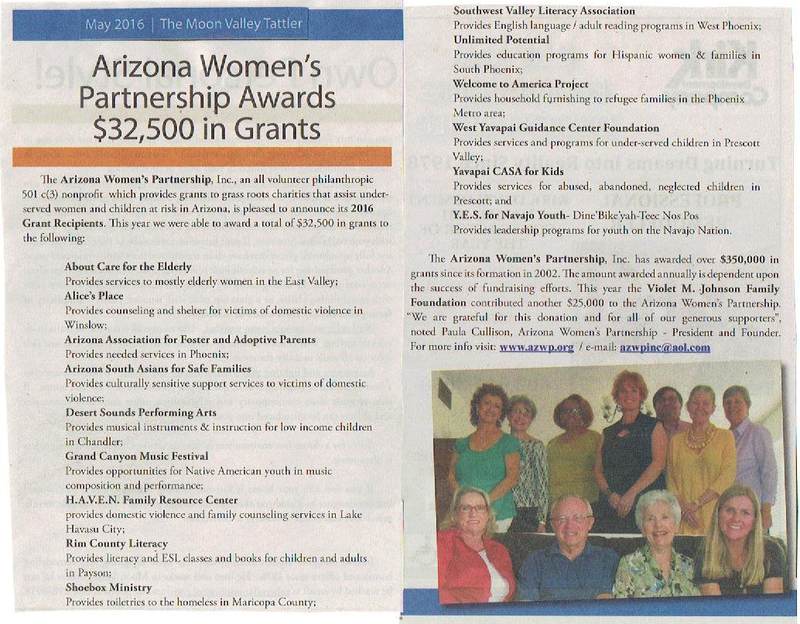 The Arizona Women's Partnership, Inc. is an all volunteer philanthropic non-profit organization dedicated to promoting the status of Arizona women and empowering women's grass roots organizations through mini grants and publicity. The organization is non-political and non-sectarian, and is sensitive to the needs of underserved and disadvantaged women and their families. Proceeds are generated from FUNdraisers and through corporate sponsorships and private donations. and the YWCA Tribute to Leadership Award for Advocacy – February 2019. A message of thanks from some of AZWP's donors. Kudos to Levi Elizaga for taking the time to film and edit this video. 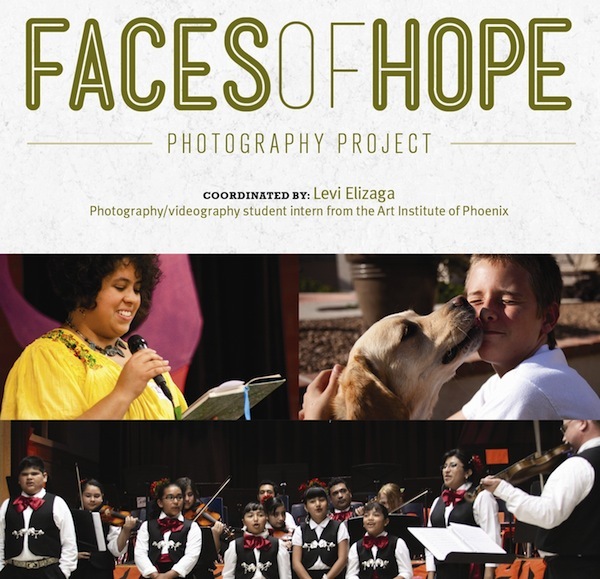 Faces of Hope photography exhibition has been at Phoenix College Library for three months, the Paradise Valley Community College Library for two months, at the ASU West Fletcher Library for five months, at the Maricopa County Sun City Library for two years, and at the ASU Downtown Phoenix Campus Library for five months. Display graphics were designed by Dereck Bermudez. The exhibit (dry mounted photographs) is available for loan at no charge. Yes, we can do it! is a photojournalism project of the Arizona Women's Partnership by photographer Tracy Rasinski. The project is funded by the Arizona Commission on the Arts, National Endowment for the Arts and the Gap Foundation and profiles beneficiaries of the AZWP grants. The project's original blog can be found at www.yeswecandoit.blogspot.com. Below are some of the photos from the reception by Levi Elizaga. 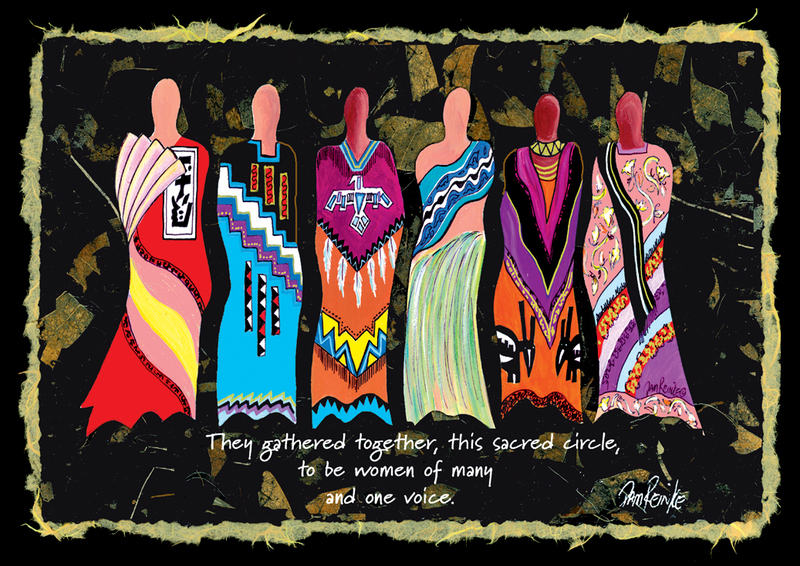 For information about the 1985-Year for All Arizona Women project (an Arizona Centennial Legacy proposal), please e-mail azwpinc@aol.com. Women of Courage, historical photographs of 48 women with biographies in 72 free standing frames, is available for loan. Arizona Historical Society is archiving ALL of the AZWP documents, articles, proclamations, and photos. We thank Pamela Gill, Evelynn Hererra, Sara Athen, Lindsey Ivison, Jane Ratcliff and Susan Rowland for scanning all of our files. Pamela Gill also transferred over 100 of our VHS tapes onto DVDs. Brandi Hale created the document on the statistics regarding at risk Women and Children in Arziona.